For almost two decades, Aspen Aerogels has built a reputation for solving thermal insulation’s toughest challenges. When it gets too hot, too wet, or too tough for other thermal insulations, owners and operators around the world turn to Pyrogel to restore performance and productivity. 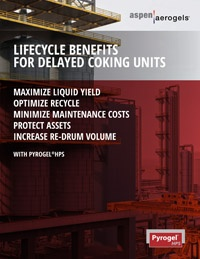 Pyrogel® HPS is engineered to minimize heat losses and help maintain uniform drum wall temperatures, thereby providing superior temperature control and promoting optimal initial coke bed formation. Achieving operating targets is critical to optimization of product yields—targets such as furnace outlet temperatures, drum inlet and outlet temperatures, and temperatures in outlet lines for the start of the cycle preheat. By reducing heat loss to the environment and increasing drum outlet temperature, production can shift in the right direction. Valuable liquid yields are maximized while reducing the amount of solid coke formation. If you've tried tuning your controls and are not hitting your targets, perhaps it is time to try Pyrogel HPS. The cyclic operating conditions of DCU's can wreak havoc on drum and pipe insulation. Repeated expansion and contraction cycles, combined with high temperatures and water ingress can destroy conventional materials, leading to performance issues. Safety is a concern when persistently wet or missing insulation can lead to accelerated corrosion, particularly on drum heads. Pyrogel’s uniquely hydrophobic, yet breathable properties are combined with a multi-layer protection to ensure that assets remain dry, and therefore, working efficiently. Superior attachment details also limit fatigue stress formation. When you insulate with an engineered Pyrogel HPS system, you provide the best protection for your DCU assets, allowing them to operate safer, for longer. Heat loss greater than allowed for in the original design of the DCU can occur as a result of uneven heating and cooling. This loss can require increases in furnace heat rates to compensate. Pyrogel HPS combats these losses for the life of the unit, allowing the DCU to get back to operating targets. Whether planned or unplanned, DCU maintenance events are complex, and downtime is costly. Routine inspection and maintenance should not automatically mean your insulation needs to be replaced. Using a well-designed insulation system that incorporates Pyrogel HPS will allow you to remove and reuse your insulation. After all, if the insulation is damaged enough to warrant replacement, it likely was not doing its job in the first place—preventing you from doing yours. Increase the thickness of Pyrogel insulation to boost liquid yield potential. Increase the drum diameter within the existing DCU cage infrastructure. Whether it is time to re-drum, re-insulate, or build a new unit, the use of Pyrogel HPS opens up new opportunities for design engineers to increase return on investment. Do you have questions or need more information about Pyrogel® HPS?